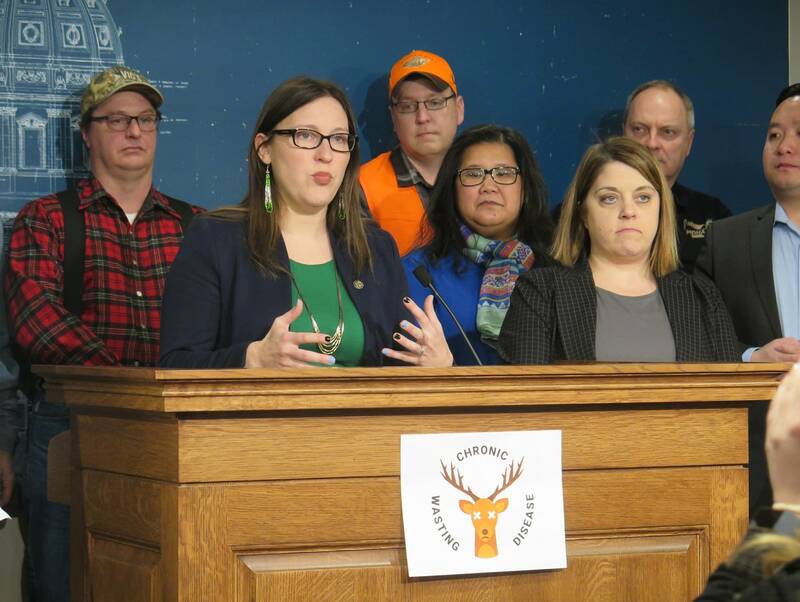 Updated: 6:41 p.m. | Posted: 4:08 p.m.
Minnesota needs to take comprehensive action this year to stop the spread of chronic wasting disease, lawmakers and hunters said Monday as they promoted legislation aimed at stopping the outbreak of the fatal brain disease before it becomes endemic in the state's whitetail herd. Rep. Jamie Becker-Finn is sponsoring several bills that target deer farms to try to stop the disease from spreading from captive to wild deer. One proposal would give the University of Minnesota $1.8 million to develop faster and more sensitive diagnostic tests that farms and regulators could use on live deer and hunters could use to make sure their venison is safe to eat. Chronic wasting disease has been confirmed in 34 wild deer since it appeared in 2016 in a "hot zone" between Preston and Lanesboro in Fillmore County in southeastern Minnesota. It's already endemic in parts of Wisconsin. The disease is caused by a misshapen protein called a prion and affects deer and elk. It spreads through saliva, feces or urine, and prions remain infectious in the environment for years. Other diseases caused by prions include mad cow disease. Becker-Finn, whose family hunts in Beltrami County, said the disease endangers hunting which she called a constitutional right. "If those animals are sick and unsafe to eat, if we can't use the parts from those animals, that right to hunt has been infringed," she said. The proposed plan calls for tighter standards on captive deer herds — in some cases offering buyouts to existing whitetail deer operations — and moving oversight of disease outbreaks from the Board of Animal Health to the Minnesota Department of Natural Resources. Lobbyist Tim Spreck says it's "preposterous" to trash Minnesota's deer farmers when most are doing an excellent job of keeping their herds healthy. Senate Majority Leader Paul Gazelka said the disease needs to be addressed. "I don't know where the science is pointing yet, but that's really where I want to land. It is being heard in our environment committees and it is a very very important issue," he said. "For deer hunters, for example, I think there's 500,000 deer hunters in Minnesota and we want to make sure that this is an issue that's taken care of."